It was the perfect place for an ambush. The narrow staircase clung to the mountainside leaving us with a precipitous drop on one side and a sheer cliff rising on the other. We knew they would be waiting, we just didn't know when the inevitable strike would occur. Rounding a corner, we finally spotted a monkey in an overhanging tree but it was already too late. Another monkey bounded down the bannister and leapt onto my shoulder, clambering round to inspect my backpack. As its tail brushed across my face, it found the treasure it was looking for and leapt into the trees. It had claimed a packet of wet wipes from the outer pocket of my bag. 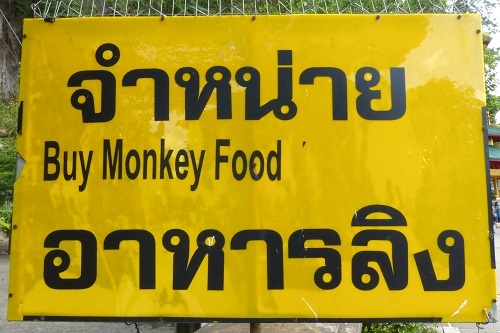 We had heard about the antics of the monkeys at Krabi's Tiger Cave Temple, and had even hidden our snacks. It hadn't crossed our minds that they might be interested in our other possessions too. We came across five more monkeys lounging on the narrow concrete steps. I ran the gauntlet, gingerly stepping past them and was relieved to reach the other end unscathed. Chris wasn't so lucky. As I stopped to watch, he patiently waited while a monkey emptied the outer pockets of his backpack. Having dropped my guard for a second, I felt the thud as yet another furry primate landed on my back. This second round of attacks claimed our sunscreen, bug spray and a bottle of iced tea. With our lightened load, and nothing else of interest, we made it past the rest of the monkey troupe unmolested. Looking back, we saw the wet wipe thief bite through the packet. He rummaged through the contents, scattering tissues in all directions. Seconds later, we saw him thrashing around furiously, with the wrapper stuck on his head. It didn't take him long to escape however. 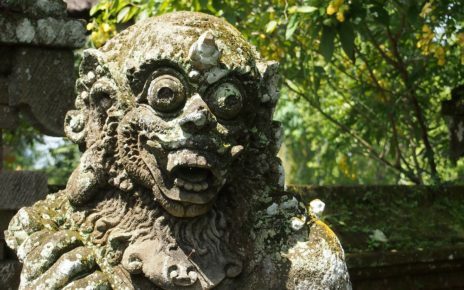 Was It Worth Climbing The Mountain At The Tiger Cave Temple? 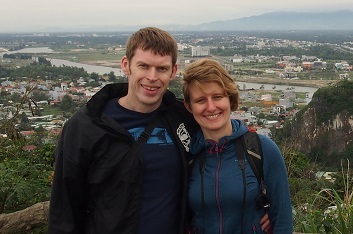 We sweated our way up the remainder of the 1237 steps that zigzagged up the mountainside. Several false summits and many water breaks later, we finally made it to the top. 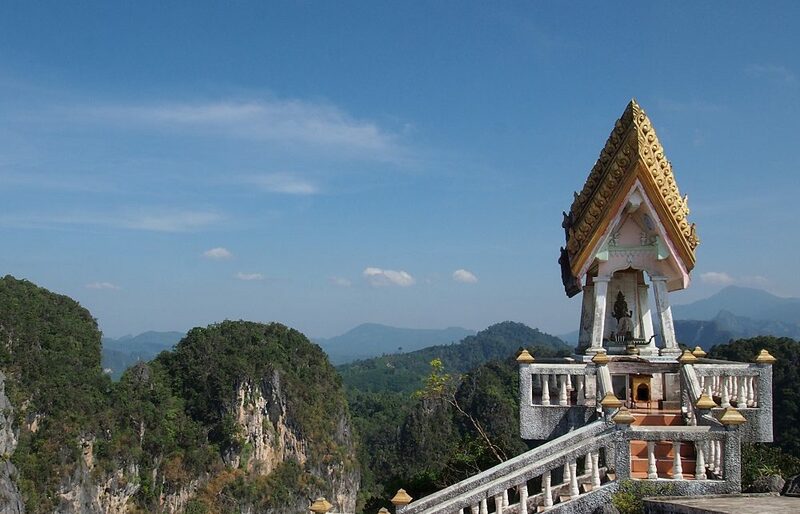 We were rewarded with panoramic views across the lush green forests to Krabi town and the limestone karst that dominates the coast. 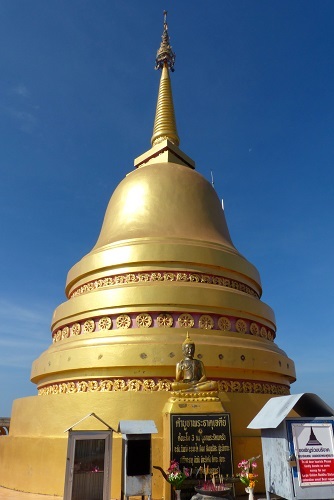 A giant golden Buddha presided over the summit, glittering in the intense sunshine. We relaxed in its shade admiring the view and eating the snacks that had survived the monkey onslaught. Fully revitalised, we began the trek back down. By the time we made it back down to the site of our ambush, our tired legs were quivering. Although our assailants had moved on, the area was strewn with bottles and wrappers. There was also a strong smell of citronella so we assume they had managed to break into our bug spray. But, was it worth it? For the views from the top, absolutely! Back at the base of the mountain, we saw signs to 'Wonderland'. Intrigued by what this could be, we followed them. We climbed even more steps and made our way around the back of the mountain on a winding forest trail. This side of the mountain was peppered with impressive limestone caves and dramatic overhangs. 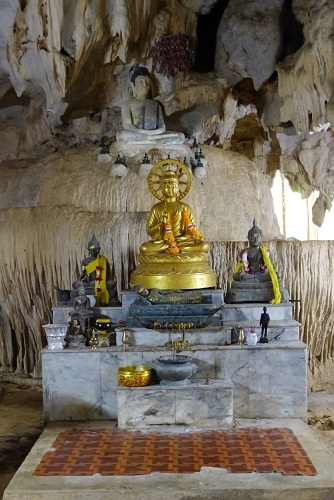 Many of these had been adorned with Buddhas that complemented the stalactites and flowstone features. Colourful murals had been painted on a cliff face and we saw monks' saffron robes hanging outside their humble cave dwellings. There was even a full human skeleton, a reminder that the body is just a temporary vessel for our eternal souls. What About The Tiger Cave? 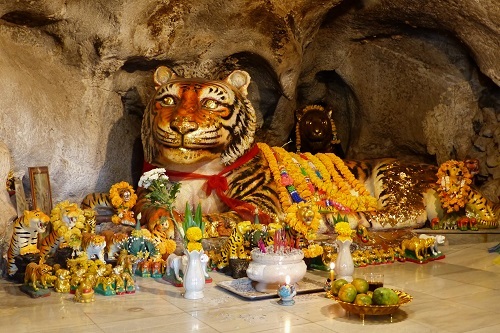 On our way out of the complex, we found the eponymous tiger cave hidden at the back of a temple. Legend has it that this cave was once home to a tiger, which sadly departed (or was chased out) when the monks moved in. The cave now contains hundreds of tiny tiger statues. The centrepiece is a life-sized tiger plastered with flakes of gold leaf and draped with garlands of marigolds. 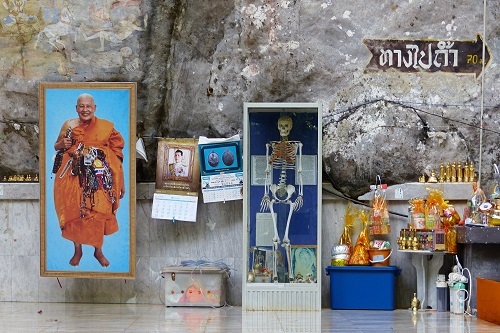 How Hard Is The Climb At The Tiger Cave Temple? 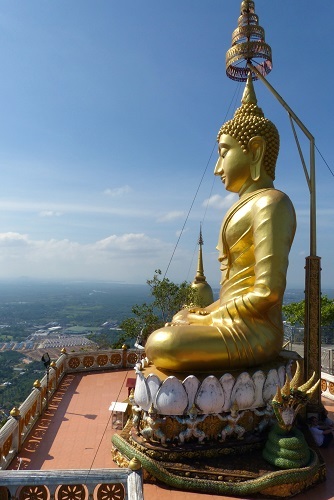 There are 1237 steps up to the golden Buddha at the summit (according to the signs, we didn't actually count them). It took us around 40 minutes to get to the top. This included a lot of breaks to catch our breath and drink water. The first flight of stairs is small and perfectly formed, which may lull you into a false sense of security. It is however all downhill from there, so to speak. Further up, some of the stairs are very narrow and high. A few are broken and crumbling. Most people are breathing hard, sweating profusely and relying heavily on the handrail by the time they near the summit. Take lots of water with you. There is free drinking water available at the top and toilets en route. 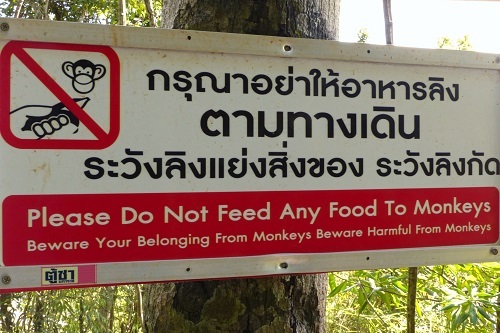 Pack everything inside your bag so you don't lose it to the monkeys. They also have a habit of stealing bags so make sure your straps are secure. 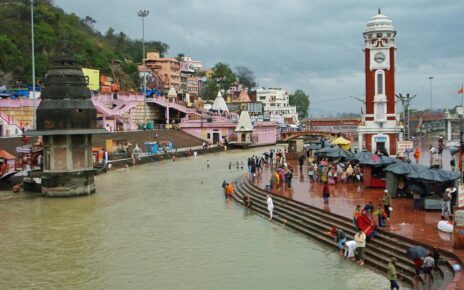 As this is a temple you will be expected to dress modestly, even for the hike up the hill. Strappy tops and short shorts are not permitted. Entrance to the Tiger Cave Temple is free but there are lots of opportunities to make donations. This includes buying coffins for homeless people, contributing to the temple's utility bills or even supporting exorcism services. 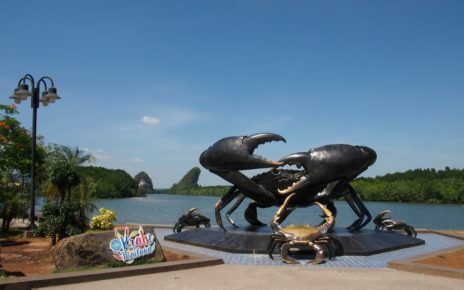 From Krabi town centre, it is around 9km to the Tiger Cave Temple. It is a straightforward walk, cycle or motorbike ride. If you plan to hike to the top of the hill however, you may want to save your energy. Some minibuses from Krabi town stop at the Tiger Cave Temple, Wat Tham Suea. We took a blue minibus, which was bound for Krabi Airport. They dropped us at the temple gate. Hail the minibus as it's driving past and tell the driver where you're going. Pay when you get off. We each paid 50 baht one way. Red minibuses terminate at the Tiger Cave Temple and we found one waiting outside when we left the temple.